Let's start off with some off the shelf large button remotes. The largest I found was this super sized one at Brookstone. You can check out Amazon.com for other large keyed remotes. This remote, the Weemote, is available in the original, senior and DVD version. The original version allows parents to block out all ten of the stations they want their children to have access to. The senior version is a (shown left) is a more mature gray color and allows more access but still has a simple interface. Enabling Devices offers this very simple wireless remote control with only five very large buttons. There are also a variety of hands free, voice activated remote controls available. Again Amazon.com is a good place to start exploring the options. There are less switch activated remote controls out there to look at. 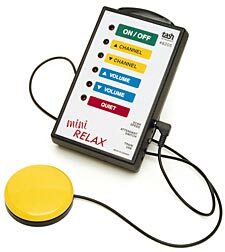 Tash offers the scanning Mini-Relax and Relax II. 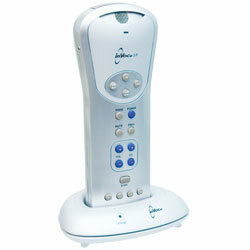 The Advocate II, available from Mayer-Johnson is capable of scanning and can be used as a remote control. Enabling Devices has a switch interface box for a universal television remote that allows a single switch to control a single button on the remote. They also offer a DVD remote with a joystick interface. Just in time to download and explore over the weekend and bring to the classroom on Monday I have some links to educational games that teach basic concepts. Hiyah offers over a dozen simple touchscreen or switch activited games about basic activities pr nursery rhymes. The programs were made by the mother of a child with Autism. Poisson Rouge is a bilingual English/French site for young children that is accessible through mouse or touch screen. It teaches ore-school level concepts with bright colors and animations. Minisebran is a set of games for the 2-6 year old set and Sebran is for the 5-9 year olds. Boith use very high contrasting picture icons and would work well for students with some vision loss. GCompris is an open source software set for ages 2-9 with a rather astounding array of games and activities. Many can be used with a touch screen. It is being used in schools around the world and is probably going to be on the $100 laptop. Childsplay is a very similar set of open source programs with similar acclaim. 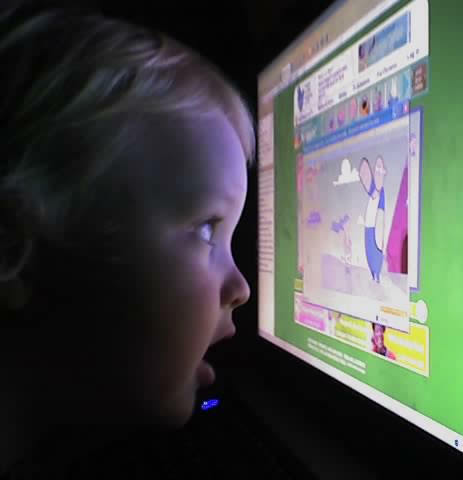 Pysycache is software designed to teach very young children to use a mouse. These very simple activities can be used to teach cause and effect. Some work with a touch screen. JILetters can also be used with a touch screen to teach cause and effect. It is time for another AT/AAC field trip. Today we are going to Japan. Let's start with some cool people using "Joy-to-Key" freeware to convert video games and dance dance revolution to special needs devices and software. DekiPower is another organization, it is creating a set of programs and a switch interface that allows and entire computer, from turning it on to use to turning it off to be done through a single switch. Nifty is a company vending swtiches and devices. I was thinking it must seem awfully Dynavox heavy around here lately. Therefore I would like to extend a standing invitation to other AAC devices manufacturers and vendors to come visit us like Dynavox did and show off your stuff! I have e-mailed a few of you, but if you have a AAC device or anything else relevant to educating learners with multiple or low incidence disabilities I am happy to have you visit and demonstrate. Go to my profile and send me an e-mail or just comment. I want to share with everyone parts of a series of e-mails I had in response to my post about the new Dynavox V.
"Let me call out the essential idea, which is this, "Where you compose what you want to say, is where you compose what you want to send." compose what you want to say, _back in the Message Window of your main communication page_. Then when you jump to the Compose window, the entire contents of your message window will be dumped in there. Chose the "To:", hit Send and you're done. - There are plenty of example pages already created that you can link to from your main communication page. Check out the "Email and Text Pages" folder in the Page Navigator. to watch as people discover what is waiting for them on the V.
As promised I am spending my afternoons this week teaching myself how to program a Dynavox DV4 as an environmental control unit. I tried to set up some x10 commands first, but was unsuccessful (missing a part). Since you don't need any extra parts to control an infrared remote control I tried that next. We don't generally watch TV or movies at school, but what the heck, I can learning how to program them with one remote and it should generalize to another remote. It was crazy easy to turn the DV4 into a remote control! I went into the Dynavox Knowledge Base and found the info I needed, by searching for "ir". I followed the first part of the directions there (setup -> tools -> ir browser) then I checked tv power and start IR learning. As soon as I clicked start I pressed the power button on the remote, which I had aimed at the top of the DV4. Then I pressed "stop learning" and "test". It worked! I could turn the TV on and off from across the room! I repeated the same steps for channel up, channel down, volume up and volume down. I learned that when you press the remote as you aim it into the DV4 you only need to press it once or else the Dynavox will learn to change a whole bunch of channels fast or jack the volume up. Although, seeing as this is a teenager's device, maybe having it fly through the channels and blast the volume isn't such a bad idea, at least as far as being age appropriate. I was so excited to get the Dynavox working as the TV remote that I wanted to show someone, but I felt like a bit of a loser envisioning myself bringing it into the hallway to show the teenagers lurking around waiting for their music lessons in the room next door. 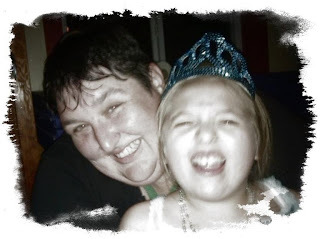 So I had to settle for a blog entry. So there you have it, easy as pie, programming a Dynavox series four as a remote control! The website for today is the new CAST Universal Design for Learning Book Builder. CAST is the Center for Applied Special Technology out of Massachusetts. CAST explores various applications of Universal Design for Learning (UDL), works with software and technology engineers to make new products accessible to all, lobbies for UDL and supports educators and other professionals in using UDL in schools and other settings. Book Builder is CAST's newest endeavor. It is an online program that aides teachers and others in writing, illustrating and displaying on a computer or in print a text for learners. There are two sample books to explore, information on creating books and, of course, information on UDL and literacy. One of the best features of this website is not the actual ability to write books and illustrate them, but the ability to have online characters aide students in reading the book. Three animated "strategy coaches" offer support to readers. Pedro the Penguin offers prompts that cue students to think critically about what they are reading. Hali offers hints that make comprehending the story easier. Monty models expert reading strategy's that will increase understanding. Book Builder is a great concept with interesting applications for the classroom. Not only does it do what some other (pricey) software does just as well (making books), but it also provides the supports many learners need when they are reading. And all that for free! I don't even know where to start. The paraprofessionals in my classroom seemed to spend the day deciding what color they would choose if they were getting one (choices: lime green, raspberry, blue berry, grey, black). Some of the student spent quite a bit of time messing around with the choice of voices (in addition to the Microsoft and DecTalk voices now there are AT&T voices). The speech therapists were happy with the new developmentally and age appropriate language software (InterACCT - very, very cool). I was thrilled that some of my tiny, whiny Dynavox 4 series complaints are solved (the keyguard is flush with the screen so no more caught fingers, it runs Windows XP and has direct internet access). I also loved the ease of adding photographs, MP3 and videos. You can even get images, sounds and videos straight from the internet to InterACCT! InterACCT uses some of the same intuitive programming features as the Gateway series did, but is has pre-made, ready-to-go boards for every age level no matter what ability. No more jerry-rigging the pre-school board set for older users who need simpler boards and no more trying to make the more complex boards fun for users who are younger and very high functioning. As always the Dynavox can be used with direct select, various types of scanning, a few different head mice, joysticks and Morse code. Unlike the series four no matter what input device you can adjust things like dwell or scan rate to suit the user. Back from the series 3 devices is the "user" feature, allowing schools and clinics to have more than one student use the same device or one individual with a fluctuating condition to have several board sets to meet different needs. Another new feature is the Boardmaker Bridge with allows easy import of Speaking Dynamically Pro boards into the Dynavox, so you aren't stuck with a SDP device forever if you don't want to re-program all those boards. Also new is the fact that you no longer have to choose between Mayer-Johnson PCS or Dynasyms, now you automatically get both! Another feature that was awesome was the symbol clipboard which allows you to select any text (like online, in an e-mail or in a word document) and it creates a page of symbols from the vocabulary! Similarly there is a piece of add on software called DynaLessons that makes teaching standards based curriculum with the Dynavox easier. Thank you Dynavox for not forgetting the teachers and our need for curriculum content! With the device the user gets a Dynavox e-mail address and a pre-installed e-mail program! The Dynavox e-mail program is adjustable from just a few buttons to create an error free e-mail to a keyboard to compose anything you want to say. Also, the Dynavox V has Bluetooth and can send text and receive text messages to/from cellphones. The best news the company representative had for us (Hi, Lori) was that in our state a new device can be purchased through state insurance in three years if there is a clinically sound reason for it, such as the student has outgrown the capabilities of the old device (which one of my students has and the device is about 34 months old). So maybe there will be a Dynavox V in my room sometime soon. See video of AT on ABC news including Dynavox V.
Since some us cannot download free software on school computers and it is IEP, standardized testing and educational re-evaluation season I have compiled a list of online stopwatches and timers, in case you forget to wear your watch with the second hand. So bookmark the one you like best for use when you need it! Endless Potential is a consulting company providing ABA services and commercial software for designing autism interventions, but buried deep in their site is a goldmine! The Endless Potential Downloads Page has three sections: coloring, flashcards and worksheets. The coloring sheets are nothing to write home about and the worksheets are nice, basic level, full color activities with a sound educational basis. It is the flashcards that are something to see. Listed under the sub-category of ABA teaching materials are forty-four folders of mostly high contrast color photographs of nouns, verbs and adjectives. These are perfect for exporting into Boardmaker, cutting and pasting into Word Documents of Power Point activities or just printing on cardstock to use as flashcards. Some of the folders have more images than others and you can pretty much skip the ones with the words, but overall I would recommend checking out this resource, especially if you have student who respond better to photos instead of pictures or who are transitioning from photos to pictures. Available entirely for free online is the Assessment of Phonological Awareness and Reading or APAR. This in and of itself is a wonderful public service, but to make the test more accessible it can be downloaded in print or as a scanning program for use with a single switch. Whether presented on the computer or in person it is designed to be a non-verbal test. It is a criterion referenced test with no norming or validity data on the website, however basic knowledge of reading assessment should making the scoring relatively clear. The test is hosted by the ELR Software site in Australia, which produces speech and language therapy materials (including the absolutely disgusting Rude Readers series - these will get any reluctant 13 year old boy to read). I have lots of little announcements today. If you are a member of Reading A-Z you should refer five friends to check out the site, because then you get three free months of Writing A-Z! For those of you e-mailing asking me to review a product, sure, no problem. Just contact me (use the comment section or go to my profile and e-mail me), send the product to me, I will bring it to my class and we will test it out! Crayola is giving away free samples to educators! The website of the day is Free Teacher Tools. If you are not a Yahoo Widgets fan or user it might be time to consider the many uses of various Yahoo Widgets in the classroom. Flashcards including pre-made Dolch sight words and math facts as well as "make-your-own"
And that's just the obviously useful stuff, not counting the mooing cows, quaking ducks, virtual Stephen Hawking speaking in his AAC voice, virtual whoopie cushion, various quote generators, comix fetchers, weather widgets and more. Many of our students in the intensive special needs classroom are feed by a g- or j-tube, either alone or in addition to oral feeding. In my first job (what feels like a thousand years ago) teachers and para-educators gave students g-tube feedings, the two schools I have worked at since then both have a nurse give the tube feedings. I have had students "graduate" from g-tubes while in my class (an exciting and scary time for families) and students start using a g-tube while in my class (also a scary time for families). Below I have created a list of links about g- and j-tubes. It is almost budget and ordering time in schools. For those of us with any sort of budget to spend on technology we might be looking for ways to stretch our resources. Campus Tech might be just what you are looking for. This online retailer stocks mostly general education and college items, however, it does have a fair number of special education software titles. Campus Tech carries the full range of Riverdeep (who now make all Edmark titles) Software. Included in the Riverdeep Assortment are the Millie, Bailie and Trudy Programs, all of which are switch accessible, as well as the Edmark Reading Program and Words Around Me. The Edmark Reading Program and Words Around Me are two highly regarded special needs titles. Campus Tech also has software from DK Multimedia, Kid Pix, Inspiration and Crick Software, including Clicker. Finally, Campus Tech carries the full range of Attainment software and several of their mid level technology, such as the one talker and the GoTalk Button. Campus Tech's prices are lower than buying directly from Attainment, i.e. the GoTalk Button is $8.85 vs. $12.00. During the APBS Conference I went to two workshops presented by Dr. Laura Riffel from the The Behavior Doctor website. The first was the Marriage of Love and Logic and Positive Behavior Supports and you can download the powerpoint and the book from that workshop. All the the handouts from all of the sessions Dr. Riffel presented are available on her website, which is well worth exploring. Much of the full day training on Saturday prepared us to conduct FBAs including using her free FBA tool. I am already using it to collect some baseline data in my classroom. If you decide to check it out please download the instructions first. It is easy to use and my instructional assistant got really into setting it up and entering data (making my life much easier). Sorry for the post paucity, but I have been at the 4th Annual International Association of Positive Behavior Support Conference, since Wednesday afternoon. It has been a great conference so far with one more day to go. You can expect a lot of positive behavior support links and information over the next few weeks as I begin to process the loads of information I learned. The site listed for the Tellus AAC device last post was, indeed, the Ohio vendor of this UK designed device. Check here for a list of vendors by state/region. FRS is offering us the ComLink, weighing in at under four pounds, running Windows XP, containing 10,000 communication symbols (including Mayer-Johnson), it has built in environmental control capability, can be purchased with an airlink to connect wirelessly, has hot swappable batteries and the greatest aspect it has 20 G of memory (for those learners with thousands of messages or who utilize the MP3 or video features). AMDI a long standing static display device company is now offering the TechTouch. It uses the VS Communicator Software with built in e-mail and text message program or your choice of other programs (i.e. Boardmaker or the Grid). It has all the same features of the ComLink above, including the 20 G of hard disk, but I saw no mention of a wireless option, except I saw no mention of a wireless feature. It comes pre-installed, if you want, with a Deassey mounting plate. I have been watching the Tellus+ overseas for a while, but have finally found out that FRS is a USA vendor of the device. The Tellus+ kicks some serious backside. It has, get this, 40 G of memory! It runs on the XP platform, has WLAN (wireless) and bluetooth! There are five "always available" buttons down the right side, that can control the volume, be a date and time button or what ever you want. It runs MindExpress or EuroSuite. All this and the Tellus+ is barely six pounds! (The only drawback? The ECU is IR (GEWA) instead of X-10.) Oh, and you can also get a mid-size or handheld version of the Tellus. You know what I want? I want to see the Tellus+ and the new Dynavox V go head to head before another device is chosen for my classroom! So FRS/Tellus and Dynavox, how 'bout it? Give us a comment and come visit my class to show us your stuff! By the way, though not included because it is not exactly lesser know is the Dynavox V. Now that thing looks cool! Sit through the intro video, it is worth it! 40 G of memory! A light sensor to determine screen brightness (what an incredible idea!)! Some of the most intuitive programming software I have ever seen! But still, a Dynavox has a stinky manual and my kingdom for a Dynavox rep in my area with some follow through, I have had an MT4 in the room for a year and we can't get a rep in to help us out for love or money~well, actually I haven't offered love or money, maybe that would work!!! Best technical support in the industry? Bah! If you like being canceled on maybe! But that being said the FRS website is twice as stinky as the Dynavox manual and they only have funding info for Ohio Medicaid (huh?) Neither of which is as bad as the Gus Communicator funding website, I dare say it is a terrible idea to brag about only being 80% covered. And I have only Assisitve Tech Inc, Satillo and Zygo to compare the Dynavox support with and neither of Saltillo nor Zygo have ever had a rep show up (although I could always get Assistive Tech Inc out when I needed them), but then again neither Zygo nor Satillo ever offered, nay, promised, in person tech support when we purchased those devices. Grinch, grinch, grinch. I sound like a bitter old lady. That is all my complaining for the month, I'm done (well at least on the blog). In the past several weeks I had the opportunity to visit a number of DMR day habilitation centers and a few of them had sensory rooms. In the end the decision of choosing a program for the family I was working with depended on more important variables than the presence of a sensory room, things like the staff to participant ratio, the frequency of community experiences, and the overall level of appropriate activities available across the program's schedule. The sensory room I saw were nothing like the advertisements you see in the catalogs like those for Snoezelen or SpaceKraft. Part of the problem was a half-hearted effort. A bean bag chair, some mylar hanging mobiles, an unbreakable mirror or two, a CD player, a lava lamp and a string of holiday lights and the room was done. There was very little that was inviting and magical like the rooms in the catalogs. Of course, the reason the rooms I saw don't look like the rooms in the catalogs is that to create a room like in the catalogs, using products from those catalogs means spending the entire teaching and administration budget for the next year. Therefore, I thought it might be interesting to explore others options to lower budget sensory rooms beyond the lava lamp and the holiday lights. When I think of all the things we use a timer for in my class room (stander use, bathroom reminders, cooking and science activities and behavioral interventions to name a few) and the sheer number of timers I have purchased only to have them break in the past few years I could become quite overwhelmed. Now it is Cool Timer to the rescue! Cool Timer is a free, downloadable program that runs on a computer (or computer based communication device?) and counts down time. What makes it cool is instead of a standard issue beeping you set it to play any .wav or MP3 on the computer. The minute I get to school on Monday I am downloading it. Harmony Hollow, the makers of Cool Timer, offer three other teacher tools to check out as well. Outside of Cool Timer, I think The Hat is another useful program for the special needs classroom. The hat is a randomizer designed to make deciding things like who goes first easier. I bet you could load in other things you would like to randomize too, like numbers to make virtual dice (put the mouse cursor over the start or stop button and use a switch to activate to adapt). 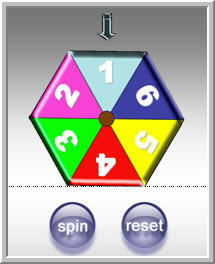 Of course there is always the Arcess Online Switch Dice and Number Spinner, if you want easier virtual dice. If you have Opus Presenter you can download some switch dice. For $19 you can download a Powerpoint Dice Shaker or spinner, plus a randomizer code to install to make your own powerpoint dice and things (or download the watermaked demo), which works fine. Adobe PDF documents are an efficient and reliable way for information to be shared online. However, they are not compatible with most screen readers and some other assistive technology. Adobe offers a free online service to convert a PDF for free via e-mail or online for the purpose of using assistive technology to access it. First Hand is a foundation that provides grants to families to cover expenses such as assistive and healthcare technology. Their goal is to prevent children with special needs from falling through the cracks in the system. Parents who need help finding funding and have exhausted other sources may be grateful for this link.